Vidstatus App has a large collection of best video status DP images & Text to share your status. 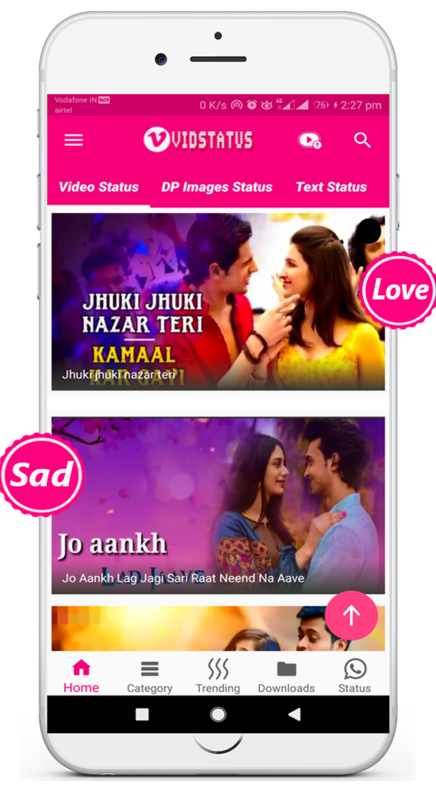 Vidstatus app has categories like Love Videos, Funny Videos, Sad Videos, Motivational Videos, Punjabi, Bengali, Marathi, Gujarati, Tamil, Telugu, Kannada, Haryanvi, Bhojpuri, Festival, English and much more Videos for your need. You can play each Video Song Status within the app and easily download a status video for WhatsApp & other social media platform. If you like any video you can share with your friends or can set it up on your Status story. Download now and if you like our Vidstatus app then rate it with 5 star, review it and share with your friends.